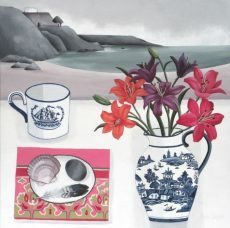 Paula Sharples was born in Brighton on the south coast in 1951. She gained a degree in Textile Design at Reigate School of Art in Surrey in the late 60’s and spent 15 years as a freelance textile designer for the international furnishing and bedding market, creating designs for companies such as Coloroll and John Wolf Decorative Fabrics in the USA and also Portmeirion and Churchill China. She now lives in the Peak District and paints at home in her studio. 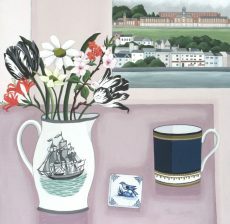 Whilst there is plenty to inspire her close to home a childhood spent by the sea informs much of her current work. 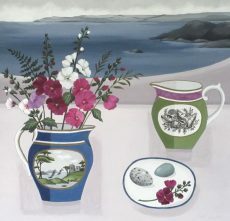 The North Norfolk coast, Devon and Cornwall, have all significantly influenced her paintings. She works on gesso prepared board with acrylics, ink and graphite in layers and uses a combination of still life with landscape background. 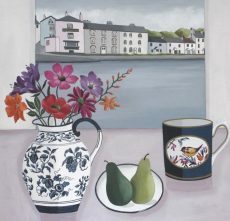 Her use of colour and pattern is evidence of her past in textile and ceramic design. 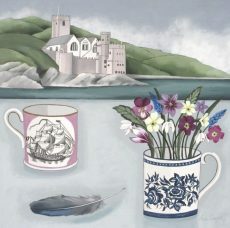 Paula’s first collection for the gallery focuses exclusively on the South Hams. Each carefully compose piece contains a reference to our locality; look out for Dartmouth Castle, Start Point, the Naval College and more! We love the cosy intimacy and simplicity of her work. 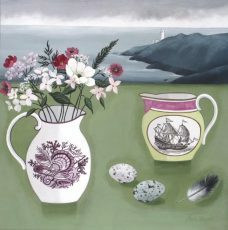 All these new paintings are available to buy or reserve now and will be in the gallery later in April.